During my formative years, vegetables were served straight out of the can. They were never sullied by heat unless accidentally warmed from sitting next to the main course. I grew up thinking I hated vegetables. Turns out I only hated canned veggies served straight out of the can. Especially canned beets. They were just Icky! Fast forward to adulthood, where I eventually discovered fire, which eventually led to discovering that vegetables, even canned vegetables, taste much better if served warm. The New York Times posted a decent selection of Rosh HaShana recipes on its website last week. 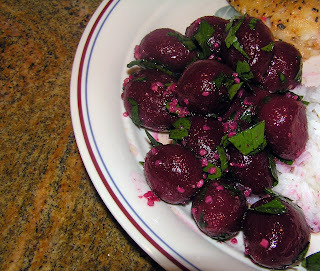 One of the vegetable recipes included this very nice beet salad side-dish (and no, it's never explained why it's called Moroccan beets) made with roasted fresh beets. But since he main course didn't require using an oven, I figured why not use beets of the canned persuasion and knock an hour off the prep time as well? Surprise! Halva (also spelled halvah or halwa) is a very international term, referring to any somewhat dense, sweetened dessert. According to Kitchen Daily, halva can be made with (depending upon the country) almost any type of grain, or as in this recipe, even no grain at all! 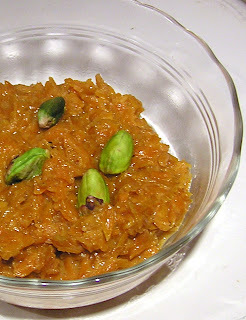 Gajar halva is an Indian carrot dessert that more resembles rice pudding. If you own a food processor or a bag o'shreds, this recipe is a snap to throw together. Even whipping out a vegetable peeler only uses up a couple minutes of your very valuable time.